I have a whole moose liver. Now what do I do? Do I skin it then slice it? How thick do I slice it? Moose liver is quite easy to prepare once you get it home from the field. First off, it needs to be thoroughly washed in cold water. As you can see in the photo the skinning of liver is not required. besides that would be a very difficult task. If possible, give your liver a good chill, like placing it in a freezer for an hour or so. That will make slicing the meat a little easier. If not, don't worry about it just start slicing. As for how thick to slice? That is really up to you. How thick do you like it? We slice ours about 3/8 inch thick. It's hard to be exact because the moose liver wiggles around some (partial freezing helps). A whole liver is going to give you a lot of slices if you plan to do it all at once. You might consider freezing smaller more usable chunks, then thaw and slice when you what to cook it up. Don't forget, that moose liver makes excellent moose Pâté! 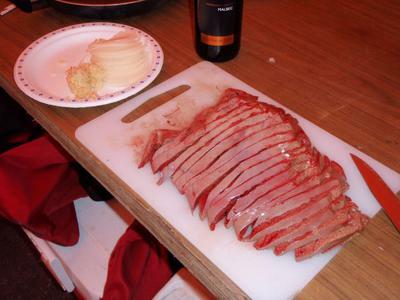 One final note: in order to slice moose liver, you are going to need a very sharp knife. One that 'slices' through without any sawing action.